ISE welcomes Dr. Jennifer Pazour joining Rensselaer as an Assistant Professor. Dr. Pazour received a B.S. in Industrial Engineering from South Dakota School of Mines and Technology in 2006, and M.S. and Ph.D. in Industrial Engineering from University of Arkansas in 2008 and 2011, respectively. She joined University of Central Florida (UCF) in August 2011. She received the prestigious Office of Naval Research (ONR) Young Investigator Award in 2013. 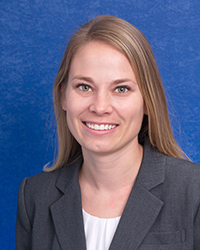 She was also named the CAE Link Faculty Fellow from the College of Engineering and Computer Sciences at UCF from July 2012 to August 2014. Her research interests are in the development and use of analytical models to guide decision making in service industries, which has focused on military logistics, distribution and transportation systems, healthcare logistics, and peer-to-peer resource sharing systems. Dr. Pazour also maintains a blog https://jenpazour.wordpress.com/ and a twitter feed http://twitter.com/jpazour describing her teaching and research, and thoughts and views related to industrial engineering and operations research.